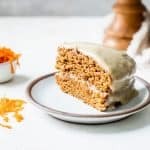 This Whole Wheat Vegan Carrot Cake is moist and flavorful. Made with healthier substitutions like flax seed, whole wheat white flour, and coconut oil for one delicious cake. Preheat oven to 350ºF; line two 9″ round cake pans with parchment paper, plus lightly grease. Set aside. In medium bowl, combine 1/4 cup flax seeds and 3/4 cup water and whisk together. Let seeds and water form gel, about 15 minutes total, whisking every 5 minutes. Pour wet ingredients into large bowl of flour/carrot mixture. Using a large rubber spatula, gently combine and then add in milk to fully combine. Disperse batter evenly into prepared pans. Make the frosting: Combine rinsed cashews with 1/3 cup of maple syrup, and 1/3 cup of non-dairy milk in a high speed blender or food processor. Process until creamy, even consistency forms. Transfer frosting to a bowl and set in freezer for 30 minutes to firm. Once chilled, whip frosting with hand mixer or use whisk. Spread a medium-thick layer of frosting evenly over first layer of cake, then layer second cake on top and frost completely. Store cake in fridge to chill and set frosting before serving. FLOUR: You can use half whole wheat, half all-purpose flour with similar results. Whole wheat pastry flour can be subbed equally. Also if looking for a gluten-free friendly option, your best bet is to use a 1-to-1 all-purpose gluten-free baking flour. I like Bob’s Red Mill. Store leftover cake in fridge up to 5 days. This cake can by made in a 9×13 pan, but baking times will differ. Check cake with toothpick at 35-40 minutes and adjust times accordingly.